The discovery by Karl Landsteiner and Erwin Popper in 1908 that polio was caused by a virus, a discovery made by inoculating macaque monkeys with an extract of nervous tissue from polio victims that was shown to be free of other infectious agents. The subsequent discovery by Simon Flexner that blood serum from infected macaque monkeys could protect against polio infection. The discovery by Carl Kling and colleagues in 1911, following an earlier discovery that polio virus could be isolated from the lymph nodes of the small intestine of monkeys, that polio virus was present in the throat and intestinal tissues of people who dies from polio. Soon afterwards they isolated virus from the intestines of patients suffering from acute polio, and importantly from family members who did not display the symptoms of polio, establishing that healthy carriers played an important role in spreading the disease. In these studies the presence of polio was demonstrated by injecting filtered fluid from the patients into monkeys, the only method then available to confirm the presence of polio (Introduction to Epidemiology, fifth edition, by Ray M, Merill, Jones and Bartlett Learning). The discovery in the early 1930’s by the Australian scientists Macfarlane Burnet and Jean Macnamara that antibodies against one strain of polio did not always protect macaque monkeys against infection with another strain. The discovery by John Enders, Thomas Weller and Frederick Robbins that the polio virus could be grown in a number of tissue types, not just nerve tissue as previously assumed, a discovery that required the use of mice and monkeys to prove that the cultured virus was indeed polio and still capable of causing paralysis. 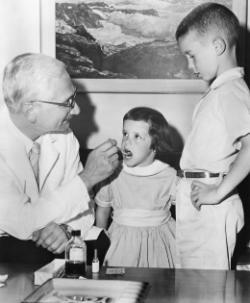 The determination in 1949 by David Bodian and colleagues at Johns Hopkins University that there were three major families of polio virus, referred to as types 1, 2, and 3, and that a separate vaccine would be necessary for each to give broad protection against polio. The discovery by David Bodian and colleagues in the late 1940’s and early 1950’s that the polio virus entered the body through the mouth, and then needed to pass into the blood stream before it could infect nervous tissue, and that if you could block the infection in the blood you could prevent the virus from entering nerve tissue and causing paralysis. The work of Enders and Bodian paved the way for the development of vaccines by Salk and Sabin. The evaluation by Jonas Salk and his colleagues at the University of Pittsburgh of vaccine candidates produced by inactivating the virus with formalin under a range of conditions, until a vaccine was identified that was effective and safe enough for human trials. The evaluation by Albert Sabin of hundreds of polio virus strains in hundreds of monkeys and scores of chimps before identifying attenuated strains that were capable of efficiently entering the body through the digestive system and provoking an adequate immune response to protect against the different pathogenic strains of polio while not causing the disease themselves. * Of course Jonas Salk is equally, if not more, deserving of this accolade. Posted on February 1, 2011 October 28, 2014 by EditorPosted in Animal Rights News, News, Science NewsTagged Albert Sabin, americans for medical progress, David Bodian, Erwin Popper, Frederick Robbins, Heloisa Sabin, hsus, Jean Macnamara, John Enders, Johns Hopkins University, Jonas Salk, Karl Landsteiner, Macfarlane Burnet, mice, monkey, mouse, paralysis, peta, polio, polio vaccine, Poliomyelitis, rhesus macaque, Simon Flexner, Thomas Weller, vaccine. Next Next post: Is tissue engineering poised to transform heart bypass surgery?